Last week the full documentary of Kony2012 was broadcast on the Australian, National Ten Network, ad free, and it got me to thinking about the rise and rise of raising awareness of war criminal Joseph Kony in Africa and just how quickly the whole issue seems to have gone world wide. In only six days it has become the most watched video on You Tube with more than seventy five million views since being uploaded. In contrast, wind back the clock to 1985 and Bob Geldof's Live Aid Concerts. Similarly Bob was attempting to raise world wide awareness and funds for famine relief and starving children in Ethiopia. I don't have any great revelations about either to share, despite doing some research and noting the Live Aid's estimated world wide audience of 1.9 billion was achieved long before we had internet and social media. Where as Kony2012 is being applauded as a demonstration of the power of social media by many commentators. I wonder what Bob Geldof would be thinking? Do you think he's thinking how much easier Live Aid would have been easier to organize with today's technology or do you think he's getting ideas, building on Kony2012 but focus it on the causes he supports? On a different note, Kony2012 has been criticized for encouraging 'slacktivism' however, one thing that can be said is, that more people are reached through slacktivism (just based on my observations of Kony2012). Whilst many of those people may not do anything substantial to contribute to the cause in any meaningful way, it's clearly an effective way to at least inform people and get some gauge of support for a cause. The more people you reach, the more chance there is of some of those people going from slacktivist to activist. I have no basis for that claim other than from a marketer's mailing list point of view. The bigger the mailing list the more conversions you're likely to get. Without slacktivism I would never have heard about Kony2012. I'm sure plenty of people are the same. Whilst I may not do anything to contribute to that cause, for the right cause, I just might be prompted to do more. As I said at the beginning I have no great revelations about any of this. I just thought I'd write out a few observations that went through my mind as I watched Kony2012 unfold. It amazed me that a social media cause moved fast enough to be broadcast nationally on a commercial television network in Australia. There's something to be said for that and the power of informing people through social media. and it disappeared just as fast where as Live Aid went on for most of that year and inspired America to do "We are the World" and Farm Aid. "Do They Know It's Christmas" was re released with new artists decades after the original which is still known of today. To be fair Kony2012 is still going. The poster campaign isn't supposed to happen until April 30 and their goal is to capture Kony by the end of 2012. Should that happen the publicity model for Kony may inspire future viral campaigns with more positive outcomes. Kony doesn't yet have the benefit and hindsight of time that Live Aid has. 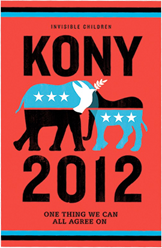 We don't yet know what the Kony campaign may lead to in terms of global social awareness campaigns.